if I say “Yes” without hesitation, she may suspect that I did not really consider the question to offer an actual opinion and that I am just saying what I think she wants to hear because I fear her and think she’s fat. if I say “Yes” after pausing for exactly two seconds, she may suspect that I supressed my highly negative gut reaction and caught myself just in time to save my own skin. if I say, “Not really. But it’s the shirt, not you,” she may take a quick inventory of every item of clothing she owns in a similar color and style and decide that I must hate half her wardrobe. if I say, “Didn’t you wear that shirt last time?” I may avoid having to answer the question entirely as I get her trying to remember what she has worn on past occasions. A bonus is that it makes her think I notice and remember what she wears. if I say, “That shirt has always looked good on you,” she will understand that I have dutifully noticed her looking good in the past, and that I have already considered the question and have reached a reasonable and acceptable conclusion. This is a good answer, but also a huge risk because it works only if the shirt is not brand new. After I run through these possible answers in a matter of miliseconds, I choose the one that best fits the situation. Like I said, I’m usually very good at this. she: Good. Then my stomach no longer looks like it’s housing a beach ball. she: So I have the flabby, stretched-into-shapelessness physique of one who has recently given birth. Is that what you’re saying? she: Yes! I have regained my pre-pregnancy shape. she: So I still look like I have a whole person growing in my abdomen? As I was trying to determine exactly what she needed to hear, three seconds elapsed. Truthfully, I thought she looked beautiful, but from her perspective I seemed to be crafting a diplomatic proclamation rather than declaring an obvious truth, which meant I thought she looked hideous. For the record, the answer she was looking for was, “No, you don’t look like you just had a baby. You look fabulous.” But even knowing the right answer, I still get confused when I think about the question. Earlier this evening, I was changing a dirty diaper on Tater. Mrs. Happy walked into the room, looked at him, and said, “Is he a sigh noo?” I thought for a moment she was inquiring whether he had joined a Psi Nu fraternity. When I asked her what in the world she was talking about, she explained that she only wondered if tonight’s episode of CSI was new or a rerun (“Is CSI new?”). I didn’t know, but I laughed anyway. I can’t find the quote now, but I remember reading an essay by C.S. Lewis in which he explained how different people bring out different things in each other. No one behaves exactly the same way with everyone they encounter. In simple terms, applied to my own life, Mrs. Happy’s Curt is quite different from Jeff‘s Curt. I can see the phenomenon pretty clearly in groups of friends. For instance, my geek friend Rey reacts to me (funny, thoughtful, relishing debate) quite differently from how he reacts to MCF (joking, prodding, argumentative) and from how he reacts to Jerry (bantering, sarcastic, antagonistic). I react differently to each of them. When the four of us get together, we all get to see levels of personality in each other we would never encounter except in the group. There have been people in my life who bring out the worst in me, and I in them. I don’t hang out with those people. Others tend to highlight the best parts of my personality. The most extreme example of this is my four-month-old son. Before I met him, I never knew I had such a seemingly infinite capacity for love. I would lay down my life for Mrs. Happy, but I would likely not have made such a sacrifice before I met her or when I first was getting to know her. On the other hand, I would have died protecting Tater even before he was born. He has also inspired an all-consuming love in his mother that has made me fall more deeply in love with her than ever before. Even strangers meet him and—I may be reading too much into their reactions, but maybe not—rediscover their sense of wonder and awe at the miracle of life. My son also sends me into fits of frustration the likes of which I have never experienced, not to mention fatigue, anxiety, compassion, and transcendent joy. So far, my Tater is pretty much the same as a stranger’s Tater in that he behaves in exactly the same way no matter who’s around. He’s beginning to understand that individuals are different, though. As he learns, he’ll glean things from me and his mother and others, and grow into a progressively more complex personality of his own. I can’t wait to see it. I read somewhere that camping brings couples and families closer together. Family camping outings turn into great memories almost invariably. Even people who can’t stand their families still look with fondness on the times they spent together sleeping in a tent and cooking hot dogs and marshmallows over a campfire. I know that one of the most enjoyable times Mrs. Happy and I have spent together happened in the hill country of Central Texas one Thanksgiving. Our wood froze, armadillos foraged in our food, and we wandered in the woods for two hours, not knowing how to get back to our camp site, but it is one of the highlights of our marriage so far. Road trips can turn into the fondest of memories as well, but not invariably. A road trip is a calculated risk when your goal is to bond. A good road trip provides stories you can tell your grandkids; a bad one makes you want to never see your traveling companion(s) again. In my college days, I took a road trip with a friend of mine from northern Indiana to eastern Texas. Our car broke down in Arkansas, and we had to sleep in the car on the side of the road while my dad drove up to help us out. We talked, we bonded, and that experience was the highlight of our good friendship. In high school, I traveled with the band from Utah to California. A flu-like condition afflicted me, my companions irritated me, and the school vice principal who rode the bus with us seemed intent on making sure no one could have fun. Fortunately, I have forgotten most of the details of that time. The drive Mrs. Happy and I took from Texas to New York five years ago was a shining example of how good a road trip can be. We talked, we laughed, we sang, we speculated, we saw the country, and we viewed hotels with the relish of newlyweds. That experience came during a time of hope and excitement and limitless possibilities. The trip from New York back to Texas was more difficult. It happened during a time of stress and uncertainty. It happened during a time when we had the sometimes overwhelming responsibility of caring for a three-month-old baby. It happened immediately after a five-day marathon of packing filled with irritability that bordered on rancor. Even so, I would not trade that trip for anything. A good friend of ours accompanied us on the journey, providing us with an extra measure of good will and Tater with an extra set of comforting arms. We were able to stop in Missouri to visit some old friends we hadn’t seen in four years, whose kids treated us to a lifetime’s worth of affection even though they didn’t remember us. We met some wonderful people in hotels and restaurants along the way. We encountered some shady characters that provided us with hours of speculative humor even after they were gone. We stopped in North Texas and introduced Tater to some family who had not yet met him. And we got to show our friend our home-away-from-home-away-from-home. It’s been a while since I last blogged. I’ve been quite busy packing, saying good-bye to some of the best friends I’ve ever had, packing until 2:00 a.m. some nights, taking care of a baby, packing until 3:00 a.m. some nights, tying up some personal business, taking care of a baby, loving my wife, packing from 2:00 p.m. until the moving van showed up 20 hours later, cleaning out the old apartment, and driving for five days half-way across the country (through ten states) from Long Island (New York) to Austin (Texas). I thank God for the friends who gave us so much help in the days leading up to our departure. We’d still be packing if not for their timely arrival and their all-out, full-tilt, can’t-slow-down attitude. I also thank Him for the amazing amount of love and support we received from our church. Furthermore, I must thank Him for giving us the perfect baby, who slept for more than half of his time in the car, smiled and played contentedly for the rest of his time in the car, warmed the hearts of every waitress and and hotel clerk who saw him, and still managed to pretty much sleep through the nights in the hotels. Anyway, being that addlepated is one of my favorite words now, I’m still in no condition to blog. Let me just say that I love my wife, and I love my son. Whatever stress we go through together, at least we’re together. My home is wherever they are, so I didn’t leave my home in New York, or return to my home in Texas—I’ve been home this whole time, just in different locations. Does the thought really count? some interesting questions of his readers. week, however, one of his questions summoned a memory. how do you feel about it today? her lots of amazing gifts, but none is as memorable to me as that stupid flashlight. to come up with really good gifts. List as many prepositions as you’d like. did you put that book that I didn’t want to be read to out of up for?" a Millionaire, then leave home and be waiting for her when she left class. for me to pick her up. we had not heard from her so we went to Penn Station to see if she was there. A few months later, she was working at a school in a not-so-nice neighborhood. to find it, while she sat in her car alone and afraid watching the sky darken. Women have a fundamental need for love from their husbands. 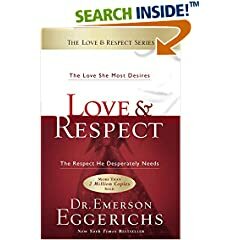 Men have a fundamental need for respect from their wives. If a wife doesn’t feel loved, she reacts without respect. If a husband doesn’t feel respected, he reacts without love. how to deal with her if she had no respect for me. thoughts as I go along.